Whether you are beginner, advanced or just a very fanatic runner, we have all been face to face with annoying injuries that have arisen during running. By taking the right measures you can 'easily' prevent them before you experience the symptoms. The well-known running injury. Shin splints is an irritation on the inside of the tibia and / or the muscles that are attached to it. The most common cause of the shin splint is due to overload. If your leg muscles are not strong enough to cope with the load, the pressure is increasingly applied to your tibia. This can cause cracks in the bone. Although small cracks in the bones are quite normal, the shin bone with shin splints does not have enough time to recover and create new bone tissue. If you ignore this pain, it is actually only somewhere and you can even suffer from an inflammation of the bones so you will have to stop running for a certain period of time. 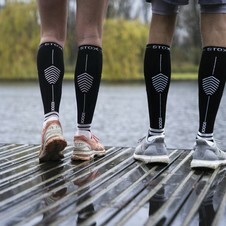 You can wear STOX to prevent shin splints or alleviate the symptoms / pain that have already arisen. Thanks to the socks, the calf muscles sit tight against the tibia, making them shake back and forth less during running. 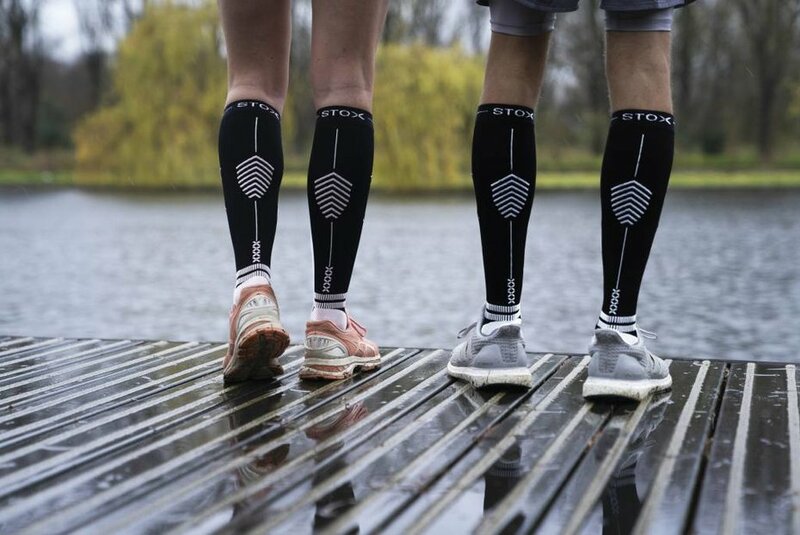 STOX Running Socks go a step further than traditional running socks. STOX ensure that your leg muscles have optimal blood circulation while running. 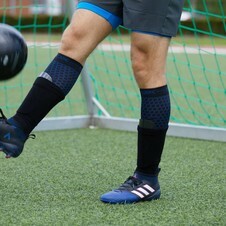 They also have a shock-absorbing effect which drastically reduces muscle damage to the legs. Thanks to the compression, the leg muscles receive sufficient oxygen and waste and moisture are quickly removed. Another one that is very common but can be prevented or treated properly. How do you get it? Usually pain in the Achilles tendon is caused by wrong footwear. Your shoes are worn and the damping has deteriorated. This pain can also be caused by an too high intensity or if you suffer from pronation/overpronation. This means that your feet and ankles are tilted in or out while running. At first you can handle this injury yourself. When the pain persists, it is always wise to have a doctor's visit. You can control the pain by massaging the sore with an ice cube (about 10min). Secondly, you can regularly do stretching exercises of the calf muscles, so that they stay nice and smooth. Finally, it makes sense to logically lower the intensity of your training. Also in case of back problems, the cause is often that you want to go too fast. Make sure you build up your training intensity, despite your enthusiasm. Make use of running schedules. We set up a running schedule for beginners. This injury will not sound unknown to you either. The 'runners knee'. A runners' knee causes pain on the outside of the knee. This pain often occurs when running. In the initial stage, this pain often develops after a predictable distance and quickly retreats at rest. Again, overload is a major culprit. Do you have a lot of trouble then it is wise to temporarily stop the running. After this, it is very important that you pick up your running again and do not go too fast. Heel spurs is a calcification of the tendon plate on the heel bone that sometimes causes inflammation under the heel. Also heel spurs are often caused by overloading the heel or foot tendons. This can be caused by running or bad shoes. If you have not experienced the symptoms of heel spurs for so long, you can easily treat them yourself. Think of sufficient rest, stretching exercises and wearing good shoes. So, now you won't have any injuries ever again? That would be nice, would not it? Sometimes running injuries are inevitable, but as you have read above, you can easily prevent them. STOX Energy Socks can help you a long way with this. 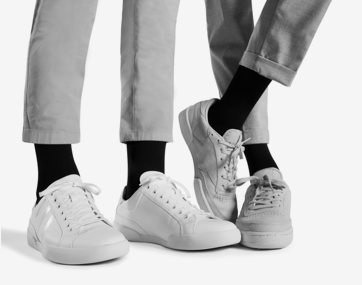 The medical compression technique ensures that the blood circulation is optimal so that you retain your energy, you do not have to hold back and have more energy to run on. Because the blood circulation is optimal, less blood and waste products remain in the legs. The chance of the above injuries is thus reduced. The shock-absorbing effect ensures that the damage to the muscle tissue is reduced to a minimum. This means you experience less muscle pain. Finally, it is super important that you do not overload your body. Even though it happens out of enthusiasm, it can get in your way. Therefore build up quietly, so that you have more fun in running.